A bawn is the defensive wall surrounding an Irish tower house. It is the anglicised version of the Irish word bábhún (sometimes spelt badhún), possibly meaning "cattle-stronghold" or "cattle-enclosure". The Irish word for "cow" is bó and its plural is ba. The Irish word for "stronghold, enclosure" is dún, whose genetive case is dhún'". The original purpose of bawns was to protect cattle from attack. They included trenches that were often strengthened with stakes or hedges. Over time, these were gradually replaced by walls. The name then began to be used for the walls that were built around tower houses. 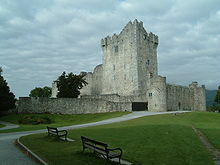 Wikimedia Commons has media related to Tower houses in Ireland. ^ See alternative traditional spellings under badhbhdhún in Foclóir Uí Dhuinnín: http://www.scriobh.ie/Page.aspx?id=26&l=1. The standard modern spelling is bábhún: Ó Domhnaill, Niall (eag. ), Foclóir Gaeilge Béarla, Baile Átha Cliath: Oifig an tSoláthair (1977), p. 73. This article about a military base or fortification type is a stub. You can help Wikipedia by expanding it.